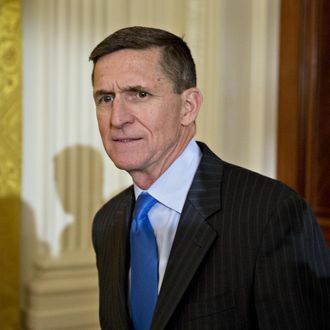 Reports that National Security Adviser Michael Flynn did, in fact, talk sanctions with the Russian ambassador during the Trump transition – and the ensuing drama – had left some questioning if the retired general might be the first Cabinet member to hear “you’re fired” from Donald Trump. “He’s speaking to the vice president relative to the conversation the vice president had with Gen. Flynn,” the statement continued, “and also speaking to various other people about what he considers the single most important subject there is: our national security.” Vice-president Mike Pence told the media that Flynn had not discussed sanctions with the Russian diplomat, apparently based on assurances from Flynn himself. About an hour before the White House sent out that rather opaque statement, Keyllanne Conway said on MSNBC that Flynn had the “full confidence” of the president. Whether that’s an alternative fact or miscommunication remains to be seen. But NBC also reports that Flynn called Pence to apologize for telling some of his own alternative facts regarding his call with the Russian ambassador. A sr adm official tells me Flynn called VP Pence to apologize for misleading him about communications with Russian ambassador.